Yoga sit-ups are a far cry from the fast, jerky exercises in a high school gym class. For one thing, they should always be done in slow motion. For another, they should always be done with full awareness of the spine as you roll up inU) a sitting position "one vertebra at a time," as hatha yoga teachers like to say. Yoga sit-ups also differ fundamentally from leglifts in that for sit-ups you are rolling up the part of the body (the torso) that controls the movement itself, while in leglifts you are raising up a part of the body that is merely connected to the lifting unit. Figure 3.21a. Intermediate position for a slow easy yogic sit-up. Figure 3.21b. Locations of muscles involved in slow sit-ups. don't have enough control to keep the back against the floor, bend the knees before you do the sit-up just as you would in crunches. Sit-ups in yoga, whether done with extended or flexed knees and hips, complement leglifls because they involve some of the same muscles. But there the similarities end. Leglifts simply flex the hips, but for sit-ups, muscles from head to toe on the l'ront of the body act first to brace and then to bend the torso up and forward like an accordion. The iliopsoas and rectus femoris muscles first act as synergists, bracing the pelvis and lumbar region and merely supporting the action of the rectus abdominis. Then as the upper body is pulled further up and forward, the hip flexors take a more active role. 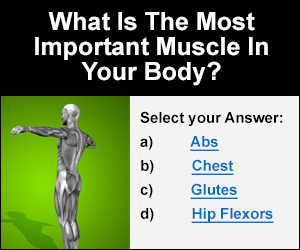 Picturing the locations of all three hip flexors plus the rectus abdominis muscle from the side makes it obvious that the rectus abdominis is the only one of the four that has a good mechanical advantage for initiating the sit-up, especially when the knees are straight and the thighs are flat against the floor (fig. 3.21b). Even if you are careful to keep the lower back against the floor as you start the sit-up, the exercise still compresses the spine and should be done for only a few repetitions. If you are looking for an athletic abdominal exercise that can be repeated hundreds of times, all modern trainers recommend that you do sit-ups by first bending your knees and pulling your heels toward your hips. When the hips arc partially flexed as in fig. 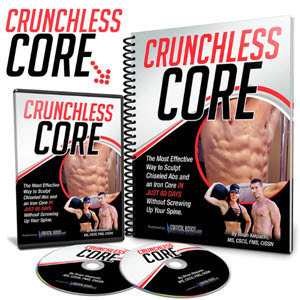 3.1, the iliopsoas and the rectus femoris are able to act more powerfully as synergists from the beginning to support rolling up and forward, keeping the pelvis stabilized at the crucial moment the sit-up is being initiated by the rectus abdominis muscles.